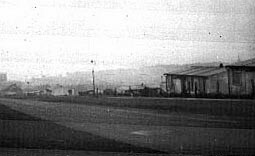 I have some vivid memories from the early 1960s in Wilson Avenue during the building of the first self build scheme in the area. My father, George Horrobin, built the fitted kitchens in all 32 of the houses. 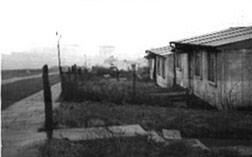 Prefabs were knocked down first. I believe lots were drawn to choose the order the houses were built in, meaning that they popped up all over the place and not in a neat row! This meant that the house used for the Mess Hut was also constantly on the move too. This building site made the most amazing playground for us kids, and there were quite a few of us. Our group of houses were at the top of the scheme, 6 pairs of houses below Danehill Road, and these 12 houses had 20 kids between them. We would come most weekends as both Mum and Dad would be there working, Mum's all making teas for the workers. We made see saws from scaffold planks with a breezeblock in the middle, or balanced the planks at both ends and then they bounced wonderfully as you danced along them. 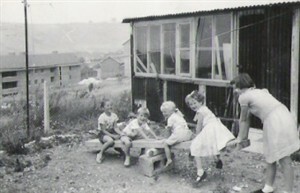 I also remember building a 'school hut' from a half circular length of corrugated iron, we used to meet up inside and chalk our lessons on the wall. One odd thing that sticks in my mind is the day they installed the fences to divide all the back gardens - it was the end of the world for the kids! Up until then we had walked up and down to visit each other across all the back gardens knocking on the back doors of course, we had worn a path in the grass! This fence was the end of all this and we then had to go out the front door and walk down the pavement and knock on the front door! We didn't think much of this. There were so many advantages to this system of house building - the main one I think is that you end up with a group that have all worked together and could be called on later for help. The plumber was up the road, there was a plasterer two doors down and the electrician was at no. 26! I remember Wilsons Avenue well. 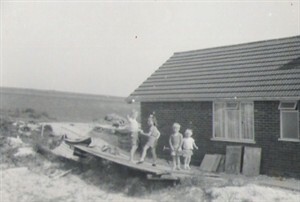 My friend Arthur was an apprentice boat builder in the early 50s before fibre glass had been thought of, and built a 14 ft sea fishing boat out of timber in the back garden of his parent's house in Plymouth Avenue Bevendean. None of us (John Langridge, Pat Mears, Arthur and I) had a car or could even drive, so the only way to get it to the sea was to haul the completed boat up to the race course on an old set of pram wheels and then came the easy part (so we thought), we just had to trundle it down Wilsons Avenue. Unfortunately, we failed to fully understand the principles of momentum, and the heavy boat got faster and faster and we all ended up madly chasing it until it eventually (and fortunately) slewed and rolled off its primitive carriage. For us teenagers, it was simultaneously scary and funny, but I dread to think what might have happened if the Avenue had the same amount of traffic as it does today.